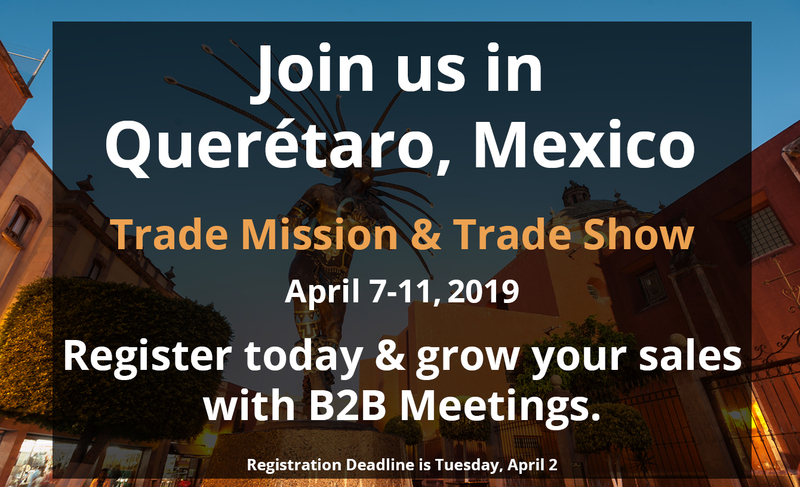 The Querétaro Trade Mission & Trade Show 2019 is open to all Arkansas companies from any industry seeking to grow their sales. Our trade director Melvin Torres will lead you to Querétaro for *one day of prearranged business-to-business meetings with buyers at the World Trade Centers Association’s 50th General Assembly at the World Trade Center Querétaro in Mexico. These meetings will be with companies who have been matched with yours as the best possible fit – companies interested in your products or services. The World Trade Center Arkansas will offer full consultation, facilitation and translation services free of charge to help you grow your sales. Companies can expect to pay approximately $1000 TOTAL including base registration, airfare, lodging, transportation and meals. After registering, you can request free booth space if you registered and made the request while booth space is still available. Once matches are made, travel is arranged by your company to Mexico however STEP Grant funds are available on a first-come, first-serve basis to eligible small businesses to offsets the costs of travel and meetings. *Please note that airfare will vary depending on the airport you depart from and the dates of travel based on your chosen registration. All you have to do is select the First Mover Discount and choose your registration option (as the base package) on the digital form to begin the matchmaking process then contact Melvin Torres to arrange facilitation. Businesses interested in utilizing a stand to exhibit their company, products or services at the General Assembly should contact Torres directly before registering. Querétaro is one of Mexico’s most highly developed regions. With over 20 industrial parks, 45 research and development centers and more than 800 world-class companies, there are strong opportunities for Arkansas businesses to export to the region. Strong economic and higher education activity between Arkansas and Querétaro already exists and our MOU signed with the World Trade Center Querétaro means we are strategically aligned to deliver you access to the best possible companies so that you can build the partnerships you need to grow your business.